Building a curved wall? Bulkhead? Arch? Let us help you speed things up and make your job easier by custom bending track or angle to whatever radius or diameter your job requires. 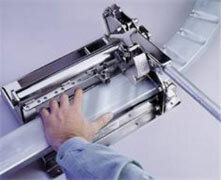 We can bend 2-1/2", 3-5/8" and 6" track. Standard, deep leg and slip track. 25 gauge and 20 gauge. We now also bend angle anywhere from 1-1/2" to 3" angle. 25 gauge and 20 gauge. Still cutting and snipping your track? Let us take the hassle out of it. Need a flashing made? Give us dimensions and details of what you require and we'll get custom flashings made to suit your requirements. 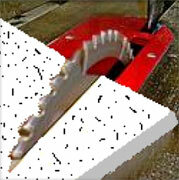 We can now cut ceiling tile down to any size you might require. Provide the exact size, type of panel and quantites and let us get you the custom sized ceiling tile you require. 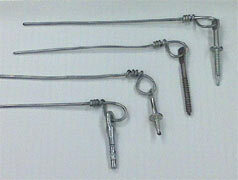 We stock and supply hanger wire for suspended acoustical ceilings. Whether it be pigtail wire for dropping through Q-deck or standard 12' wire, we have what you need to get the job complete. Custom length required? No Problem, we can even get them pre-tied to your fastener of choice! Let us know how we can help get your job started.